We are happy to present new LingvoSoft translation and language learning software for Windows and Windows Mobile. The new software is ideal for language learners and travellers alike. These fully comprehensive products have been released to facilitate your languages studies and to speed up the learning process. The new titles have been designed for over 25 languages with still more yet to come! UK Special Offer! Order today and get 15% off the regular price! Plus get a free CD and free shipping! Combining a bi-directional translating dictionary with an extensive 400,000 word vocabulary Dictionary, a talking PhraseBook containing over 14,000 travel-oriented phrases divided into 15 of the most useful categories, our famous FlashCards language learning application to help you memorize new vocabulary and improve your spelling, and the most sophisticated full-text translator around to help translate emails, business letters, technical documentation, and WebPages - our lately released LingvoSoft Professional Suite covers every type of language use in one user-friendly and responsive package. Instantly turning your desktop or laptop PC into the most sophisticated personal language learning and communication assistant ever invented, it is truly one of a kind. Perfect for anyone who needs to work with foreign languages, LingvoSoft Professional Suite is a revolution in modern communication. So much more than just a language translator this extremely effective learning tool, and business assistant is the most innovative approach to language use yet created by the award winning team of designers, linguists and programmers at LingvoSoft. Click here to view all available LingvoSoft Professional Suites for Windows. Click here to view all available LingvoSoft Professional Suites for Windows Mobile. Brand-new LingvoSoft Learner's Suite has been released for Windows and Windows Mobile for more than 40 language combinations! These versatile new programs incorporate LingvoSoft Talking Dictionary, LingvoSoft Talking Picture Dictionary and LingvoSoft FlashCards. Perfect for anyone studying a foreign language the new suites features several amazing tools that allow you to learn quickly and effectively! The new suites support Windows 7 and Windows Mobile 6.5! Click here to view all available LingvoSoft Learner's Suites for Windows. Click here to view all available LingvoSoft Learner's Suites for Windows Mobile. The newest LingvoSoft Suite is a dynamic language learning and translation solution for your computer or handheld PDA. This remarkable utility answers all the needs of almost any user of foreign languages. Businesspeople, travelers, students, and professional translators will all benefit from its wide range of unique features. Fully-integrated and compatible with the most popular MS Office applications (Word, Internet Explorer and Excel), it extends the functionality of your existing word processing and Internet tools with the added benefit of instant translation. LingvoSoft Suite integrates a speech-enabled, bi-directional translating dictionary with an extensive vocabulary; an outstanding talking phrasebook that meets the requirements of international travel and communication in a variety of situations; and the ever-popular FlashCards language learning application that helps you memorize new words as you play. Click here to view all available LingvoSoft Suites for Windows. Click here to view all available LingvoSoft Suites for Windows Mobile. LingvoSoft Talking Text Translator delivers high-quality, effective and accurate full-text translation of any text or document - business letters, technical documentation, e-mail and much more. Remarkably handy and easy to use, this powerful application allows users to enter text for translation in three different ways - by opening a text file, by copying text from another application via the clipboard, or by entering it directly using the incorporated virtual keyboard. As an added benefit, the contents of the clipboard are translated automatically upon launching the dictionary application to make it even more hassle-free. Then, at the touch of a button, it will pronounce the translation out loud in the language of your choice. Click here to view all available LingvoSoft Talking Translators for Windows. Click here to view all available LingvoSoft Talking Translators for Windows Mobile. LingvoSoft Traveller's Suite integrate LingvoSoft Talking Dictionary, LingvoSoft Talking Picture Dictionary and LingvoSoft Talking PhraseBook. The new software has been released for more than 40 language combinations! These new comprehensive software solutions contain everything the prepared traveller may need. As a special bonus, the Windows Mobile Suite includes our award-winning Travel Dictionary ML11 which delivers instant English to Czech, Finnish, French, German, Italian, Polish, Portuguese, Russian, Spanish, Turkish bi-directional translation and offers advanced functionality, extensive language information and responsive virtual keyboards for all included languages. Click here to view all available LingvoSoft Traveller's Suites for Windows. Click here to view all available LingvoSoft Traveller's Suites for Windows Mobile. Brand-new LingvoSoft & Ectaco Language Teacher! Now priced at £12.95/£25.95! LingvoSoft/Ectaco Language Teacher for Android and Windows Mobile is the perfect solution for those too busy to attend regular language classes or needing extra help with their studies. Like having your own personal tutor, it provides an interactive and intuitive way to build your language skills and begin speaking in no time at all. Including four easy to navigate sections that focus on the most important areas of every language, it provides the perfect basis for all you future language studies. Click here to view all available LingvoSoft Language Teacher software for Android. Click here to view all available LingvoSoft Language Teacher software for Windows Mobile. Brand-new LingvoSoft & Ectaco Talking Dictionaries! Now priced at £12.95/£25.95! LingvoSoft/Ectaco Talking Dictionary is a part of unique suite featuring advanced speech synthesis and an extensive vocabulary. The new software provides immediate bidirectional translations of all the words and phrases in its massive database. And with its fully adjustable interface that includes multi-lingual settings, it has never been simpler or more convenient to work with a foreign language. New LingvoSoft dictionaries feature full integration with other popular LingvoSoft applications as well as with many MS Office applications - which means you can use handy time savers and shortcuts to import and export words from the dictionary. And with its extensive customisation features you can even create and edit your own personal dictionary entries! Also recently added are an English explanatory dictionary and a synonyms search feature that allows you to find synonyms for words in both languages. Click here to view all available Ectaco Talking Dictionaries for Android. Click here to view all available LingvoSoft Talking Dictionaries for Windows. Click here to view all available LingvoSoft Talking Dictionaries for Windows Mobile. Brand-new LingvoSoft & Ectaco Talking PhraseBooks! Now priced at £12.95/£25.95! LingvoSoft/Ectaco Talking PhraseBook is a part of a revolutionary suite of language learning tools. Providing 14,000 commonly used phrases organized in 15 topics, it instantly translates in either direction between languages. Featuring advanced speech recognition and crystal-clear output of native-speaker voice narration it is the most efficient and effective way to improve your command of a second language. New LingvoSoft PhraseBooks provide full-integration with LingvoSoft FlashCards and LingvoSoft Dictionaries and are sure to become a part of your global solution to international communication and the key to lasting success. Click here to view all available Ectaco Talking PhraseBooks for Android. Click here to view all available LingvoSoft Talking PhraseBooks for Windows. 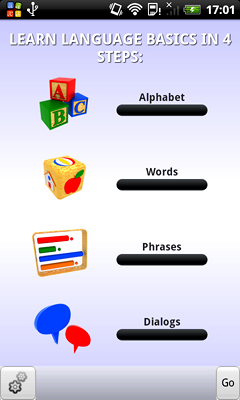 Click here to view all available LingvoSoft Talking PhraseBooks for Windows Mobile. Brand-new LingvoSoft FlashCards! Now priced at £20.95! LingvoSoft FlashCards include 5 engaging and effective games incorporating three levels of general vocabulary as well as Business, Computer, Medical, and Legal terminology. With a truly unique, customisable interface you can choose from a variety of options to make it function just the way you want - including a choice of up to 5 different display languages. In addition, you can easily create your own list of words and phrases to practice by adding them to the User Dictionary. The new software also features highly efficient integration with LingvoSoft Dictionary and PhraseBook allowing you to import data from these applications to make this an almost limitless utility. Click here to view all available LingvoSoft FlashCards for Windows. Click here to view all available LingvoSoft FlashCards for Windows Mobile. Latest Releases! LingvoSoft Talking Picture Dictionary! Order today for only £14.95! LingvoSoft Talking Picture Dictionary is a simple to use system of pictures which helps you find the words you need quickly and accurately, without the need to know either its spelling or pronunciation. Featuring high quality, colour pictures for each entry, learning a foreign language has never been easier! Now new words are memorized faster and more completely through the Picture Dictionary's proven method of enhanced picture use. The inclusion of a word pronunciation feature for both languages narrated by professional announcers in high-definition digital recordings means that you will instantly know how to say something correctly, and get it right the first time. Moreover, the new software can be fully integrated with LingvoSoft FlashCards, PhraseBook, and Dictionaries to make finding additional information easier than ever before and to extend functionality and usefulness. Click here to view all available LingvoSoft Talking Picture Dictionaries for Windows. 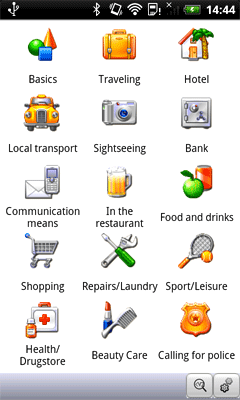 Click here to view all available LingvoSoft Talking Picture Dictionaries for Windows Mobile. All new products are available for free trial and sale at our online store. LingvoSoft full text translators for Windows Mobile! 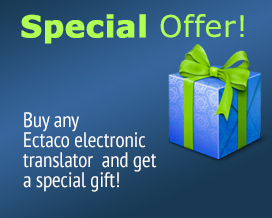 Translate texts, e-mails and web pages instantly! UK Special Offer! Order today and get 15% off! Plus get a free CD and free shipping!